Summer means sunny days, warm weather and, for many businesses, an influx of customers. With all that activity going on, your employees might work up a sweat in their traditional uniforms. For something a little lighter and more comfortable for the summer weather, outfit your staff in stylish polo shirts from Sharper Uniforms. While you might prefer a long-sleeved shirt or button-down shirt for the rest of the year, those uniform choices can look a bit stuffy comes summer. A polo shirt keeps your employees looking style-appropriate for the season while also helping them stay comfortable. The short sleeves and lightweight fabrics ensure that staff members can stay busy throughout their shift without working up a sweat. 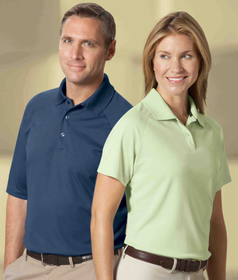 When you order uniform polo shirts from Sharper Uniforms, you’ll get plenty of options for customizing the look. Consider adding your logo to the front or back with screen-printing or embroidery services. In addition, you’ll have a variety of colors from which to choose, and polos are available in 100 percent cotton, poly cotton blends and 100 percent polyester moisture-management fabric. One of the best things about uniform polo shirts from Sharper Uniforms is that they can be worn in such a wide variety of industries and careers. From food service to hospitality, recreation to relaxation, there’s no limit to the different types of jobs where employees will look sharp and feel comfortable in a polo despite the summer heat. Browse the selection of men’s and ladies’ polo shirts available at Sharper Uniforms to find a perfect fit for your staff this summer. Free shipping is available on qualifying orders.